How do I contact NHBSR? May I intern at NHBSR? When and where is your next Conference? Does NHBSR endorse any global standards? May I have a copy of your annual report? May I have a copy of your mailing list? Who are the members of NHBSR? How can I request printed materials about membership? Is membership an endorsement of a company and its CSR efforts? What are my company's obligations once it becomes a member? When can my company or organization join NHBSR? I'm writing a check, can I pay for membership in currency other than US dollars? What forms of payment does NHBSR accept for membership? How does my company or organization join NHBSR? Does BSR offer membership for individuals? My company has just done innovative CSR work, how may I get it mentioned in NHBSR's newsletter? How can my company or organization promote its membership in NHBSR? How do I tell other NHBSR members about my company or organization, and the services we offer? What happens once I've submitted the Membership Application? NHBSR posts all available unpaid internship positions in our NHBSR Jobs section and through the University of New Hampshire's Internship office at (603)862-4136. If you are interested in an unpaid internship with NHBSR, send your cover letter describing your area of interest and résumé to info@nhbsr.org. No phone calls, please. The NHBSR Spring Conference takes place in early May each year. Information about our upcoming conference can be found here. NHBSR does not establish or promote particular standards in CSR or in any related issues. This enables NHBSR to be in an objective position to positively engage with companies. We will be publishing our first Annual Report shortly! Please email Michelle Veasey to request notification of the report publish date. No, to protect our members' privacy, NHBSR does not share its mailing list with third-party organizations. No, NHBSR does not provide certification. A list of NHBSR's members is available here. 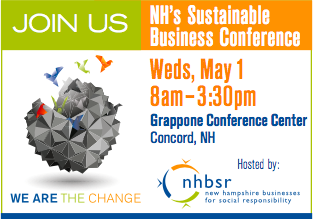 NHBSR fosters socially and environmentally responsible business in New Hampshire, recognizing that people, principles and profits must be linked. To help NHBSR reduce the environmental impact of our operations, please refer to our website for current membership information. To receive an information pledge by mail, send your name, title, business mailing address, phone, fax and email address to info@nhbsr.org. No, membership in NHBSR is not an endorsement of the member company or organization, its policies, practices or performance, or that of any subsidiaries or business partners. We ask that all members read and adhere to our membership policies, created to protect our members' privacy, the value of membership, and the intellectual property of NHBSR. NHBSR places no other formal obligations or expectations on its members in terms of their policies, practices or performance. Payment covers twelve months and renews in the month your company joins. NHBSR sends an invoice for renewal 60 days prior to renewal. Membership may be initiated any time. At this time, payment is accepted in US dollars only. NHBSR accepts payment by credit card (VISA, Master Card, or American Express) or check made payable to "NHBSR." Membership dues are non-refundable. Annual dues are based on a company's gross annual revenues. Complete a Membership Application, and send it to NHBSR with your first year's annual membership dues. You can download an application and fax or mail it to NHBSR. Instructions can be found on the application. Yes, Membership in NHBSR is open to individuals and companies. NHBSR is an inclusive membership organization; membership is open to all companies, regardless of size, sector, location, level of CSR experience, corporate reputation or other factors. There are no standards for CSR performance that must be achieved before a company can become a member of NHBSR. Email your news to Leila Murphy, Outreach Manager, for consideration as source material. NHBSR requests that members obtain permission to use NHBSR's name, logo and statement of membership by contacting info@nhbsr.org. Members may place NHBSR's logo, a statement of membership, and/or a link to the NHBSR site (www.nhbsr.org) on their website. Members may also use NHBSR's name and logo on other promotional materials with approval. The use of NHBSR's name and logo are proprietary and protected by federal law. Membership and use of NHBSR's name and logo cannot be used as a statement of endorsement. Members may not send mass communications or other solicitations to other members. NHBSR does not distribute third-party solicitations. NHBSR encourages our members to utilize the NHBSR message board located under the Resources tab of the NHBSR website. Members may also alert NHBSR staff about unique news and notes that may be included in the NHBSR newsletter or as a part of our rotating Member Profiles and Featured Members. NHBSR will acknowledge your application upon receipt of your payment. NHBSR will send a "Welcome Kit." In addition, NHBSR will contact the Primary Representative to schedule a call with you to further discuss how NHBSR can provide assistance to you and your company.